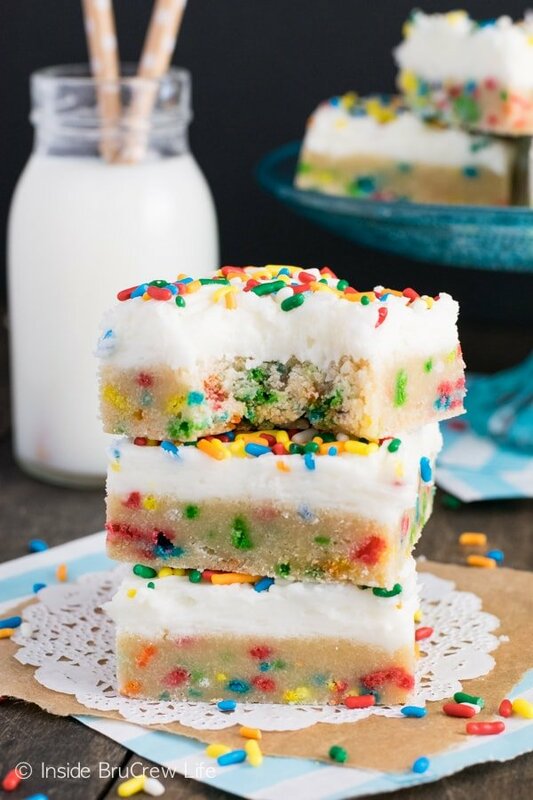 These easy Funfetti Sugar Cookie Bars are made and frosted in one pan. Saving time in the kitchen means more time eating soft chewy cookies! For the past 2 years my husband and I have been going to a local cross fit gym and working out together. It is kind of our daily date thing. I have to admit that I still do not like getting up super early, but I do like that my clothes are fitting better. I also like that I can tell I am getting so much stronger. Lifting and moving things is easier to do when you have done some strength training. We had an old wooden piano in our basement from when our kids took lessons a few years ago. This past week my husband took out the piano guts, so he could put one of the church keyboards in it. I can proudly say that only the two of us carried it up the basement stairs. One of the ladies at our church looked at us like we were crazy…but hey, working out gives you muscles! Last week I took a trip and had a carryon bag that was stuffed pretty full. I didn’t have any trouble putting in the overhead bin though. When we landed, the gentleman behind me asked if the big one was mine and if I needed any help. I just smiled and said, “No thanks, I got it.” He looked at me so skeptically! I have to admit it gave me great pleasure to lift it out with no problem at all. You should have seen the look on his face then. LOL! It totally made my day! Another thing that makes my day is not spending all day cutting and frosting cookies. 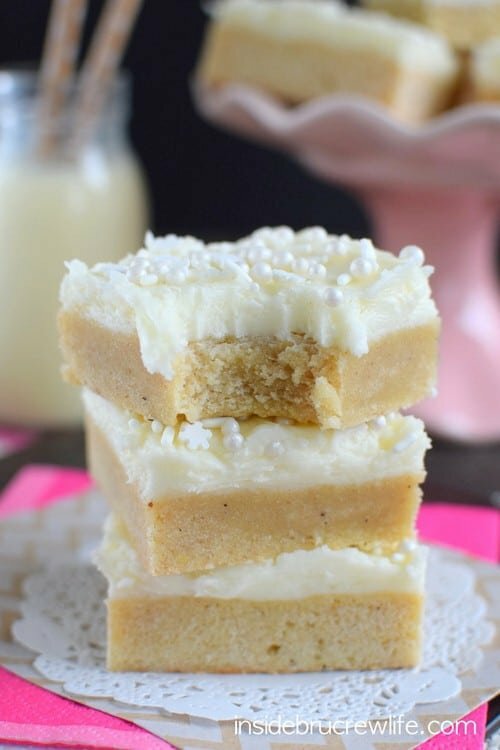 Every since I realized how easy sugar cookie bars were to make, I have not spent much time on cookies at all. I know one of these days, the cookie cutters will have to come out for more cinnabon sugar cookies, but until then it’s bars all the way!!! I love sprinkles…probably a little too much. We won’t talk about how many jars of different colors and kinds might be lurking in our cupboards. I mean you never know when a batch of funfetti cookies and cream fudge might be needed, right? Sprinkles just make treats so much more fun. 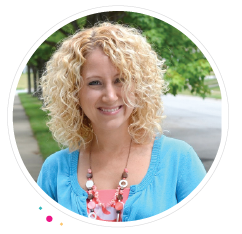 Although a few people in our house don’t seem to agree with me…we won’t name names, right dear hubby? 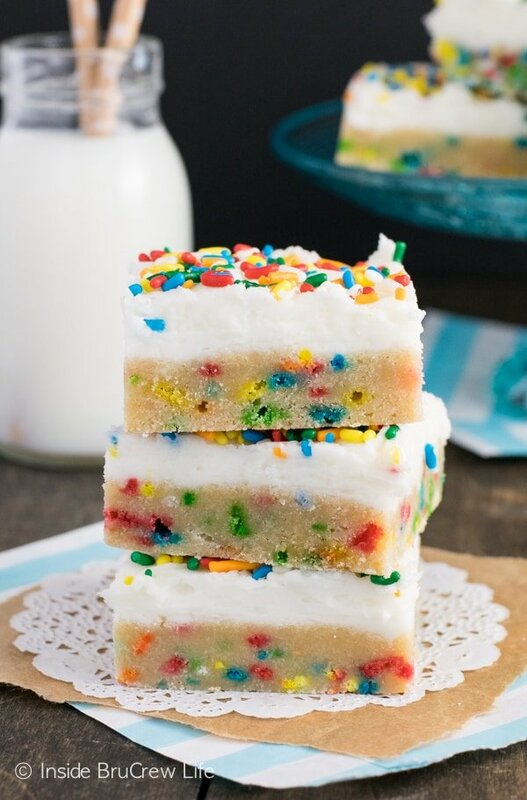 The great thing about these funfetti bars is that you can change out the color of sprinkles to match any theme party. Use your favorite college team colors for tail gating. You can also use different colors to match any holiday party. 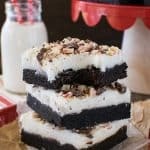 Cut them into bite sized squares and lift a few to your mouth. 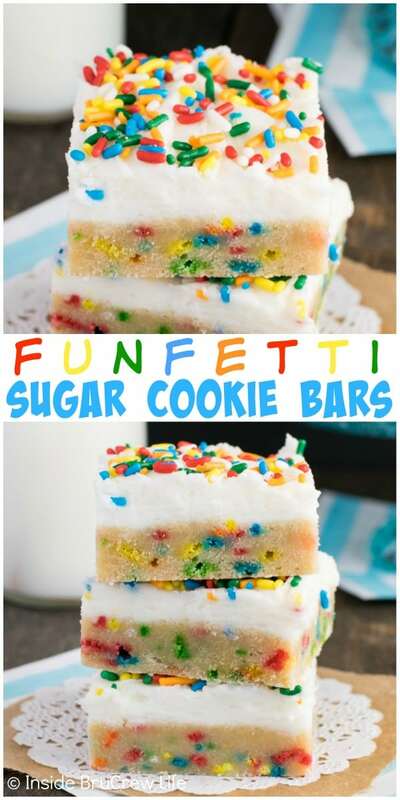 You will be in sugar cookie heaven in no time at all!!! 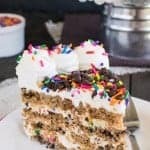 These easy cookie bars are loaded with sprinkles and topped with a fluffy butter cream frosting. Beat the butter and sugars until creamy. Add the egg and vanilla and beat again. Mix together the flour, baking powder, salt, and sprinkles. Slowly beat in to the butter mixture. Press the mixture in a greased 9x13 glass baking dish. Bake at 375 degrees for 15 minutes. Remove and cool completely. Beat the butter, vanilla, and salt. Slowly mix in the powdered sugar and whipping cream until completely combined. Beat on high until light and creamy. Spread over the top of the cooled cookies. Top with more sprinkles. Cut into 24 squares. Store in a sealed container. These bars are so fun! And I agree, bars are so much easier than cutting and rolling cookies. 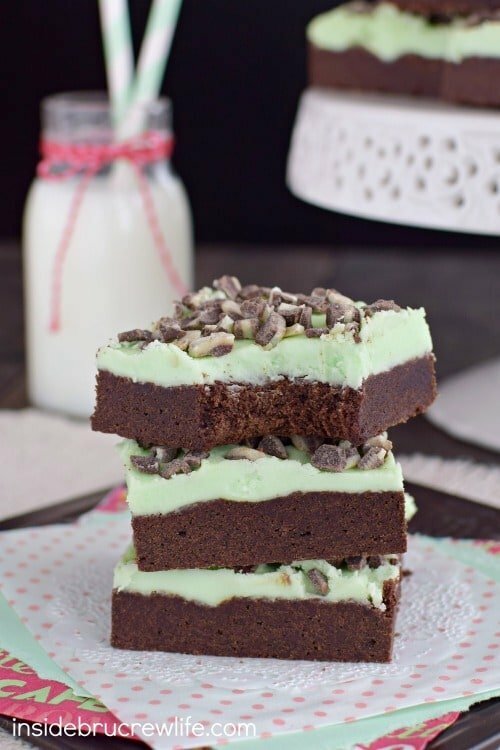 Definitely so much easier in a bar form…I may even do all my Christmas cookies this way…to save time of course!!!! 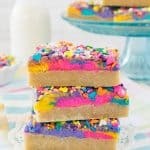 These sugar cookie bars look so pretty! 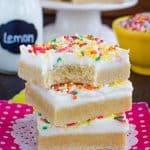 I really like the idea of making sugar cookie bars, rather than having to cut out individual cookies! Bar cookies save so much time in the kitchen. I say do it!!!! Yay for strength training! It’s really the most empowering thing women can do. It keeps our muscles toned and our bones healthy. I’m a big fan! Plus it’s a date with your husband, so double win! These bars look incredible. Really, you can’t go wrong here! Yay for strength training and dating all in one. Fist bump!!!! 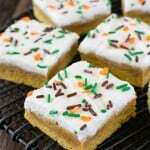 I’m all for making sugar cookie bars versus individual cookies! Love the thick layer of frosting on these! Wow, crossfit every day! That’s dedication! Awesome. Also awesome are cookie bars! 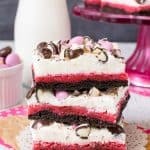 Yay for easy (and pretty) desserts!! It’s either dedication or craziness…I’m not sure which. LOL! Cookies are my favorite, but cutting/rolling and waiting for different pans to bake seems like it takes forever. These look like the best of both worlds! yeeeessss these look so yummy! I love sugar cookies but frosting them is the pitts! 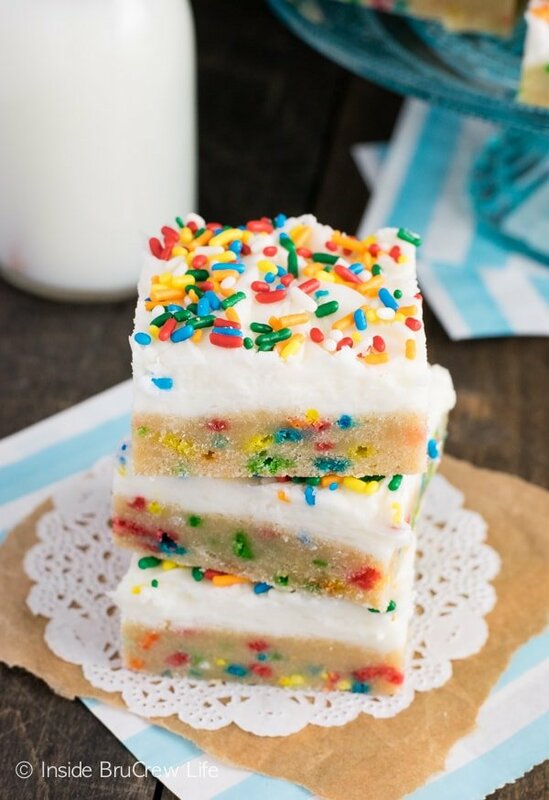 I love this Funfetti version of your yummy sugar cookie bars! Looks amazing! 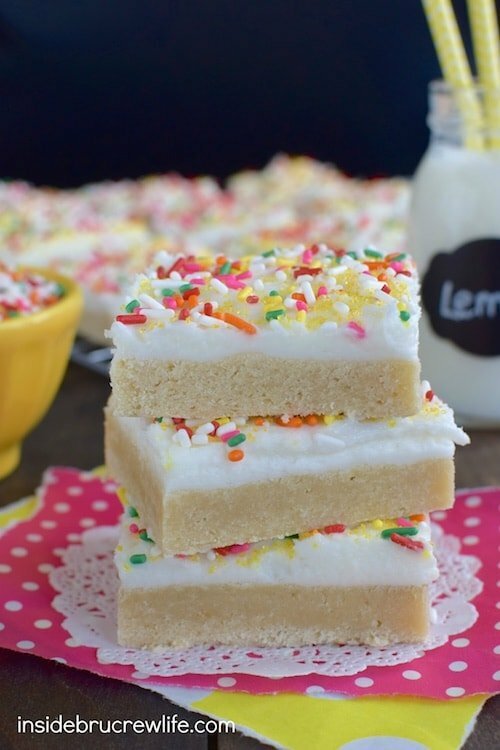 I LOVE a good sugar cookie bar!! What are you thoughts on doubling the recipe for a full cookie sheet of bars? I think that sounds great. How big is your cookie sheet? This recipe is for a 9×13 pan, so the baking time is for that size. As long as your dough is the same thickness as what it would be in a 9×13, the baking time would be the same. When I bake these bars, I actually cut the 24 in half, so it makes 48 smaller bars. These look so good I would love the recipe. Thank you so very much and God Bless You. These are so tasty! For the icing, because my son can’t have milk or cream, we subbed in about 1-1/2 c of plain Greek yogurt and 1/2 cup water, and then when mixing the icing found 3 cups of powdered sugar made it thick enough but the extra half cup would’ve made it too thick. I am so glad your family enjoyed the cookie bars! And that’s an awesome substitution for the frosting. You can also just make the frosting with all water for future batches! 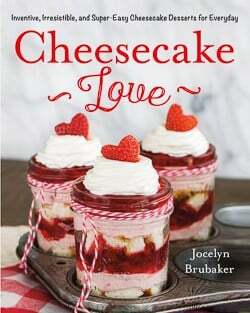 So i tried this but in a silicone cupcake pan i had…..BINGO! Had to bake again in less than an hour! My husband and kids loooved it. I also used only granulated sugar because in my country is impossible to find brown sugar.